After the loss of my sweet Miniature Schnauzer Lucy (read Miniature Schnauzer Lucy’s Tribute here), I needed to fill a void in my heart. I went looking and found Buddy. At 7 weeks Buddy was so very cute and so little. At 3 lbs he was a bundle of energy with lots of love. My little guy is now 12 weeks old and I can't ever imagine not having him in my life. He is so loving and loyal. Buddy has been very easy to crate train and good at potty training, too. 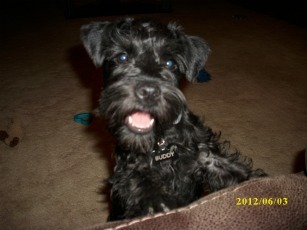 He already knows sit, stay and go nite nite.I still miss my Lucy girl but having Buddy has taken my pain away.